Project Anime: Tokyo is a unique B2B event that occurs right before Anime Japan in Tokyo. Join us for roundtable discussions, informative presentations, and networking opportunities curated specifically for anime events, fandom, and Japanese content professionals to promote Japanese Pop Culture content in the global Entertainment Industry. Project Anime annually returns to Tokyo, Japan just ahead of Anime Japan to curate a top-tier B2B conference. Our Tokyo conferences have a specific focus on networking, community building, and creating relationships between Japanese content professionals and event business professionals. This could be a great opportunity to network with business and event professionals, learn the "best practices" of working with overseas partners, and how to expand the exchange of Japanese content across the globe. We work hard to craft an enriching experience for you and your team to grow, network, and get those hard questions answered in organizing your Business, promoting Japanese Pop Culture, and creating partnerships. We plan to cover some common challenges, such as talent acquisition, growth logistics, talent management, budgeting, marketing strategies, and more. 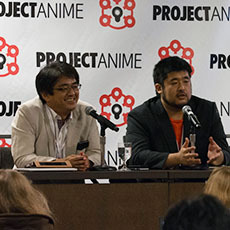 Project Anime is a B2B conference that began in 2012 and is organized under the Society for the Promotion of Japanese Animation organization.Our primary mission for Project Anime is to create a space where we can build a community and uplift each other with the common interest of Anime, Japanese Pop Culture, and facilitating growth in the industry. We strive to be a secure and open forum for all event and business professionals to connect and aim to make this conference accessible to all levels of businesses and partnerships. Meet other Japanese Pop Culture business and event professionals from around the world and build a community. Learn from influential professionals in the Entertainment Industry and how to partner with them to expand the reach of your content. For more information on our next Project Anime: Tokyo B2B Conference, please click the button below.